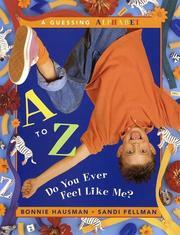 Children's Picture Book Database at Miami University | A to z do you ever feel like me? A to z do you ever feel like me? Hausman, Bonnie, “A to z do you ever feel like me?,” Children's Picture Book Database at Miami University, accessed April 21, 2019, https://dlp.lib.miamioh.edu/picturebook/items/show/6059.